The Eat Smart School Nutrition Program Guide is a resource for School Nutrition Services staff members and for all others who plan, purchase, prepare, or promote foods in the school environment. In the United States, the United States Department of Agriculture (USDA) administers the National School Lunch Program (NSLP), the School Breakfast Program (SBP), as well as the Child and Adult Care Food Program (CACFP), and After School Meals Programs of meals and snacks. Due to the large proportion of schools participating in these programs, the guidelines and recommendations contained in the Eat Smart School Nutrition Program Guide are tailored for schools that must follow the mandatory guidelines set forth by the USDA. School Nutrition staff members can use Eat Smart as a resource to supplement their program, to assist with meeting the USDA's regulatory criteria, and to promote and market their program. Non-federally funded schools can also use Eat Smart as a guide or supplement for their food service operations. Parents, teachers, and administrators are encouraged to use Eat Smart as a resource to assist them when planning which foods to offer at school functions, class parties, staff development events, and for vending machines and fundraisers. The Eat Smart School Nutrition Program enables School Nutrition staff members, administrators, teachers, and parents to work collaboratively to coordinate and deliver healthy food and nutrition education to students. Eat Smart is most effective when it is used as part of a coordinated school health effort, in which all CATCH components are working together and health promotion is practiced and taught throughout the school and at home. Nutrition and physical activity messages from CATCH classroom lessons, take-home activities, and physical education classes can be reinforced through the changes and promotions in the cafeteria. In addition, School Nutrition staff members are encouraged to coordinate snack activities with classroom teachers, conduct cafeteria tours for teachers and student groups, attend CATCH team meetings, and participate in campus-wide wellness initiatives and activities. CATCH recognizes that School Nutrition staff members are a critical part of the school health education team. Meals eaten at school play a vital role in the health and well-being of school children. Students that participate in the school breakfast and lunch programs consume about one half of their daily nutrient and energy needs from these meals. In 2015, 30.5 million children participated in the NSLP in a typical day. Research has shown that lunches offered through the NSLP were of higher dietary quality and were more nutrient-dense than lunches consumed by nonparticipating students. Therefore, schools can have a positive and significant impact on the overall quality of children’s diets. Schools have been required to serve nutritious meals to students based on a standard meal pattern since 1946, when the National School Lunch Program (NSLP) was established. Stricter guidelines have been implemented over the years for NSLP and the School Breakfast Program (SBP) in response to evidence that children’s diets are inadequate in fruits, vegetables, whole grains, and calcium-rich foods, and too high in fat, saturated fat, sodium, and added sugar. The Healthy Meals for Healthy Americans Act of 1994 required that meals under the NSLP and SBP meet the recommendations specified for children in the Dietary Guidelines for Americans, which form the basis of federal nutrition education, food, and other health-related programs. In response to the growing concerns over health problems related to childhood obesity, the United States Congress mandated in the Child Nutrition and WIC Reauthorization Act of 2004 that all school districts with a federally funded school meals program develop and implement a wellness policy that includes nutrition guidelines to address nutrition and physical activity. In order to support and strengthen local wellness policies, Congress directed the Centers for Disease Control and Prevention to undertake a study with the Institute of Medicine (IOM) to review and make recommendations about nutrition standards for school meals and competitive foods—foods that are not regulated through the National School Lunch and Breakfast Programs. The IOM released these standards in April 2007. In 2010, the Healthy, Hunger Free Kids Act (HHFKA) was passed, which further strengthens nutrition guidelines for school meals and other foods sold at schools. The HHFKA is an extension of the Let’s Move campaign that focuses on child obesity as a significant public health problem. In response to the HHFKA, the USDA released new school nutrition guidelines in January 2012. These were followed by guidelines for foods served in schools (Smart Snacks in Schools), which were implemented during the 2014-2015 school year, changes in CACFP released in 2016, and more guidance for Local School Wellness Policies was implemented in 2016. School nutrition guidelines are targeted to the general public and provide science-based advice to promote health and to reduce risk for chronic diseases through diet and physical activity. 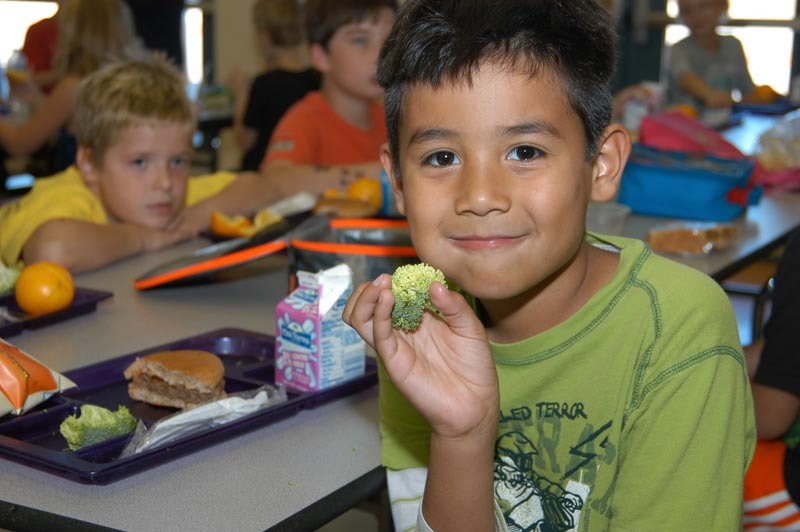 The U.S. Department of Agriculture (USDA), Food and Nutrition Service (FNS), School Meals Initiative (SMI), directs regulations and policies that address nutrition standards for school meals, which include the NSLP and the SBP. In addition to federal regulations, states and local governing authorities may also institute additional guidelines for foods offered to schoolchildren. 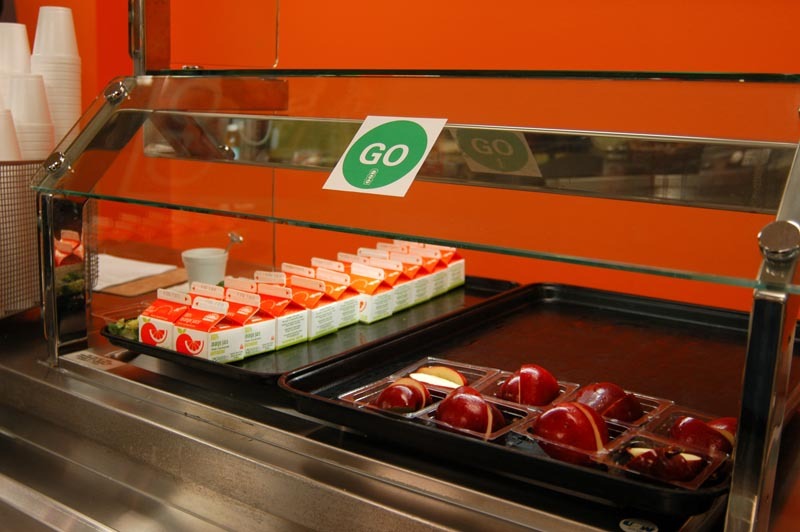 The CATCH Eat Smart Program supports these nutrition standards, as well as the IOM standards for competitive foods, and the coordinated process required to meet federal and state regulations related to serving healthy foods to students. Eat Smart also provides information and resources to help plan healthy meals and snacks, to educate and model healthy eating practices, to enhance students’ ability to learn through better nutrition, and to improve the health of students through coordinated school health efforts. GO foods: Examples include fruits and vegetables, whole-grain foods, and unflavored 1% milk. GO foods are commonly described as “whole foods,” meaning that they’re generally the least processed compared to foods in the same food group/section. These foods are also lowest in salt (sodium) and/or added sugars. In addition, GO foods are lowest in unhealthy fats—that is, solid fats such as butter or lard, as opposed to healthy fats, which are vegetable oils. WHOA foods: Examples include candy, cookies, chips, fried foods, ice cream, soft drinks, and sugary cereals. WHOA foods are generally the most processed and are highest in unhealthy fats, added sugars, and/or salt. SLOW foods are in between GO foods and WHOA foods. Examples include sweetened (including flavored) 1% milk, refined-grain foods, and fruit with added sugar. The goal of Eat Smart is to provide students with tasty, healthy meals while maintaining the required levels of essential nutrients and student participation. to coordinate healthy messages with teachers, administrators, parents, and the community. Planning menus that meet the Eat Smart objectives and support the USDA National School Lunch and Breakfast Program guidelines. Meals should include a wide variety of fruits and vegetables, foods that contain whole grains, few added sugars, are less processed, and are lower in sodium, saturated fat, and trans fat. Purchasing foods and commodities that meet the Eat Smart objectives. Preparation methods that provide a nutritious variety of foods by following standardized recipes, using standardized measuring utensils, and using appropriate serving utensils to control portion size and ensure a consistent and adequate amount of nutrients. Promotion of healthy foods, nutrition education, and physical activity through a wide variety of strategies including menus, posters, games, point-of-service signs, taste-tests, websites, and other resources. Encourage the use and promotion of the cafeteria as a laboratory for eating nutritious foods, learning about nutrition, sampling new nutritious foods, and coordinating nutrition messages with other school staff members and parents. Eat Smart supports the federal mandates to provide healthy meals to students through the objectives listed above. Eat Smart also addresses issues related to school wellness policies, nutrition education and promotion, fundraising and nutrition marketing, and working with the school community through school health/nutrition advisory councils.